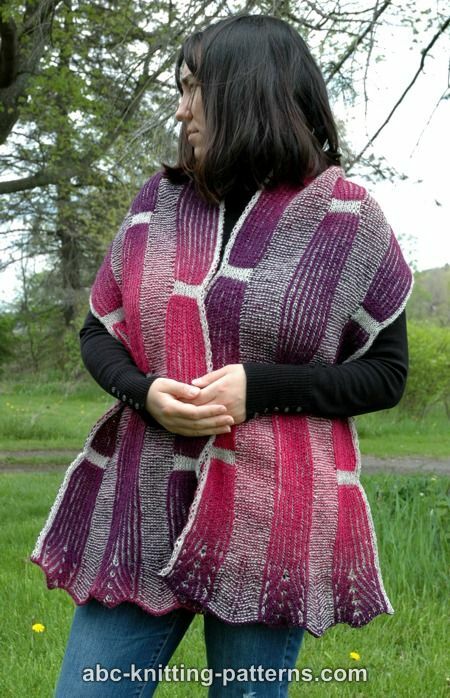 Recently, I have been looking at combining brioche with more traditional types of knitting. 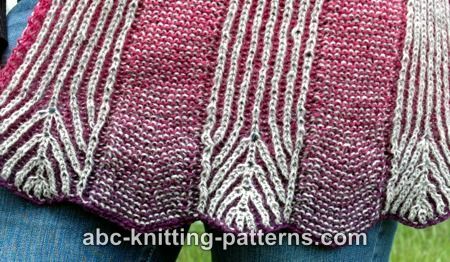 This shawl is an example of that, interspersing bands of brioche stitch with 2-color garter stitch. When the shawl is laid out, it makes me think of the lines on a highway, flashing past as you drive over them. Robert Frost's poem came kind of naturally to mind and this became the Road Less Traveled By Stole. 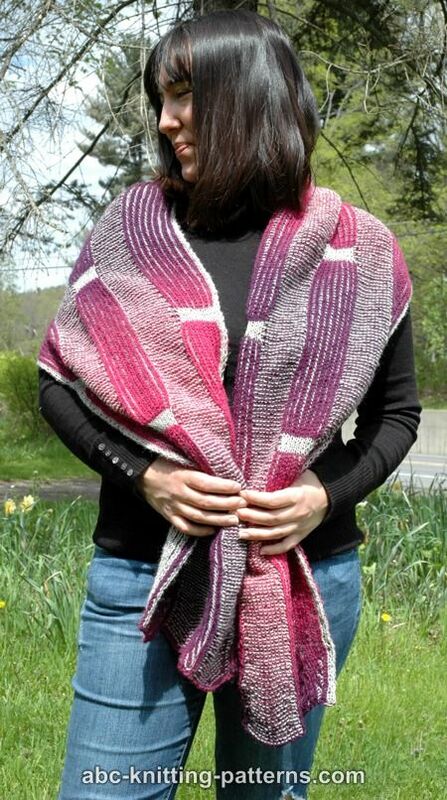 The stole combines stripes of 2-color brioche with stripes of 2-color garter stitch. This sets up some interesting color effects. 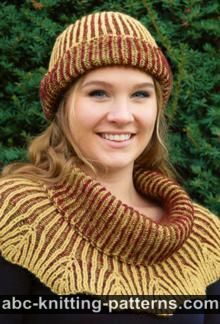 By playing with the color sequence in the garter stitch, the brioche stripes end up being knitted in contrasting colors to the garter stitch bands. 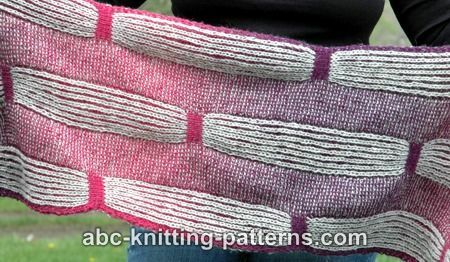 The double knitting stripes along the brioche bands add a third dimension to the color effects. The ends of the stole are decorated them with chevron-like edging. 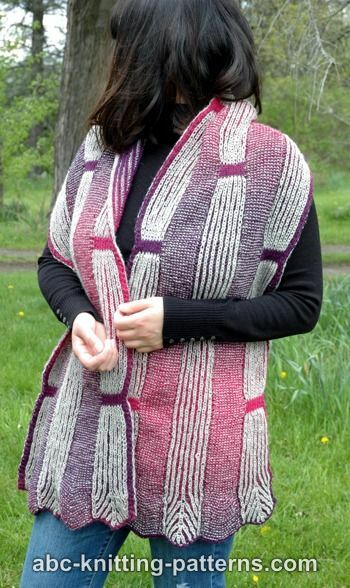 To knit the stole, you have to be familiar with how to knit 2-color brioche and 2-color double knitting pattern, and know how to decrease and increase brioche stitches. I think this would be a good practice pattern for someone who recently learnt brioche. US 2 (2.75 sm) circular needles. It is possible to use double-pointed needles, but even the 8” long dpns are not long enough to accommodate required number of stitches. US 4 (3.5 mm) needles for cast on. brk4stinc - brk1, yo, brk1, yo, brk1 into the same stitch: 1 stitch increased to five. br4stdec – this decrease is worked over 5 sts: 1st, 3rd and 5th are brk and 2nd and 4th are brp. Slip 1st and 2nd separately knitwise, place 3rd st on a stitch marker or cable needle, knit 4th st, pass 2nd st over, transfer st to left needle, pass 5th st over, transfer st to right needle, pass 1st st over, place 3rd st on left needle and transfer st on left needle, pass 3rd st over, transfer finished 4 st decrease to right needle. 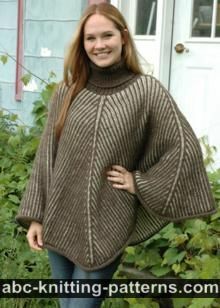 The 3rd st is a marked st.
brk2tog (right slant 2-stitch decrease) – work to 2 sts before the marked st. slip 2 sts knitwise (st with yarn over and single st) and knit (bark) them together. Return this st to the left needle and pass the marked st (st with yarn over) over. Move this st to the right needle. m 1 (Make 1 increase) - I used the increase described by Elizabeth Zismerman: Make a backward loop over the right-hand needle and in the next row knit (purl) it as a regular stitch. ssk – slip the first st as if to knit, slip the next st the same way; transfer the sts back to the left needle and knit both sts together. The instructions are for a 15-stitch stripe. Row 1 (LS LC): sm, (yf, sl 1, yb, brk) 7 times, yf, sl 1, yb. Do not turn, slide work to the other end of the needle. Row 1 (LS DC): sm, (brp, yb, sl 1, yf) 7 times, brp. Turn. Row 2 (DS LC): sm, k 1, (yf, sl 1, yb, k 1) 7 times. Do not turn, slide work to the other end of the needle. Row 2 (DS DC): sm, yb, sl 1, yf , (p 1, yb, sl 1, yf) 7 times. Turn. Row 3 (LS LC): sm, (p 1, yb, sl 1, yf) 7 times, p 1. Do not turn, slide work to the other end of the needle. Row 3 (LS DC): sm, (yf, sl 1, yb, k 1) 7 times, yf, sl 1, yb. Turn. Row 5 and 7(LC and DC): repeat row 3. Row 8 (DS LC): sm, yb, sl 1, yf, (p 1, yb, sl 1, yf) 7 times. Do not turn, slide work to the other end of the needle. Row 8 (DS DC): sm, k 1, (yfsl1yo, k 1) 7 times. Turn. Row 1 (LS LC): Beginning of the row: bring LC under DC, p 1, yb, sl 1, yf, p 1, yb, sl 1. End of the row: yb, sl1, yf, p 1, yb, sl 1, yf, p 1. Do not turn, slide work to the other end of the needle. Row 1 (LS DC): Beginning of the row: sl 1, yb, k 1, yf, sl1, yb, k 1. End of the row: k 1, yf, sl1, yb, k 1, yf, sl1. Turn. End of the row: yf, sl 1, yb, k 1, yf, sl 1, yb, k 1. Do not turn, slide work to the other end of the needle. End of the row: p 1, yb, sl 1, yf, p 1, yb, sl 1. Turn. 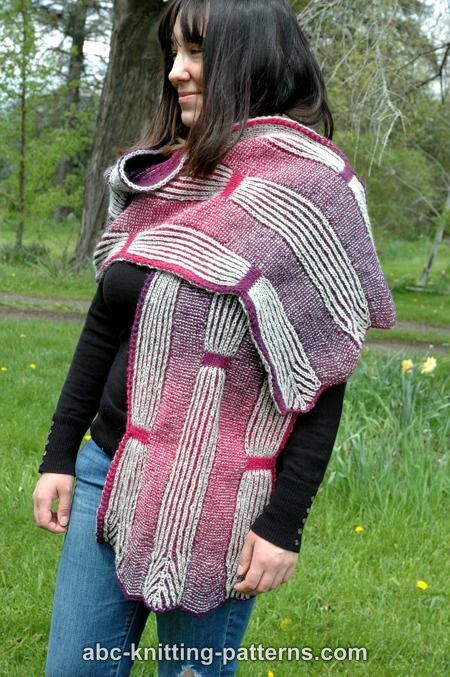 The stole is worked in two-color brioche stitch and two-color garter stitch, alternating stripes. 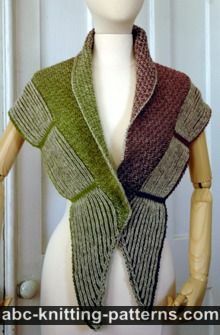 Although the stole is completely reversible, the light side of the stole is considered the right side (for this pattern). Set-up row (DS, LC): k 1, yf, sl 1, yb, k 1, yf, sl 1, sm, *(yf, sl 1, yb, p 1) 9 times, yf, sl 1, yb, sm, k 15, sm, repeat from * 1 more time, *(yf, sl 1, yb, p 1) 9 times, yf, sl 1, yb, sm, yf, sl 1, yb, k 1, yf, sl 1, yb, k 1. Do not turn, slide work to the other end of the needle. Set-up row (DS, DC): sl 1, p 1, yb, sl 1, yf, p 1, sm, *(brk 1, yfsl1yo) 9 times, brk 1, sm, p 15, sm, repeat from * 1 more time, *(brk 1, yfsl1yo) 9 times, brk 1, sm, p 1, yb, sl 1, yf, p 1, yb, sl 1. Turn. Row 1 (LS, LC): bring LC under DC, p 1, yb, sl 1, yf, p 1, yb, sl 1, sm, *yfsl1yo, brkyobrk, yfsl1yo, (brk 1, yfsl1yo) 2 times, br4stdec, (yfsl1yo, brk) 2 times, yfsl1yo, brkyobrk, yfsl1yo, sm, p 6, p3tog, p 6, sm, repeat from * 1 more time, yfsl1yo, brkyobrk, yfsl1yo, (brk 1, yfsl1yo) 2 times, br4stdec, (yfsl1yo, brk) 2 times, yfsl1yo, brkyobrk, yfsl1yo, sm, yb, sl1, yf, p 1, yb, sl 1, yf, p 1. Do not turn, slide work to the other end of the needle. Row 1 (LS, DC): sl 1, yb, k 1, yf, sl1, yb, k 1, sm, *brp 1, sl1yof, p 1, sl1yof, (brp 1, sl1yof) 6 times, p 1, sl1yof, brp 1, sm, k 1, m 1, k 11, m 1, k 1, sm, repeat from * 1 more time, brp 1, sl1yof, p 1, sl1yof, (brp 1, sl1yof) 6 times, p 1, sl1yof, brp 1, sm, k 1, yf, sl1, yb, k 1, yf, sl1. Turn. Row 2 (DS, LC): bring LC under DC on LS, k 1, yf, sl 1, yb, k 1, yf, sl 1, sm, *(sl1yof, brp 1) 9 times, sl1yof, sm, k 15, sm, repeat from * 1 more time, (sl1yof, brp 1) 9 times, sl1yof, sm, yf, sl 1, yb, k 1, yf, sl 1, yb, k 1. Do not turn, slide work to the other end of the needle. Row 2 (DS, DC): sl 1, p 1, yb, sl 1, yf, p 1, sm, *(brk1, yfsl1yo) 9 times, brk 1, sm, p 15, sm, repeat from * 1 more time, *(brk1, yfsl1yo) 9 times, brk 1, sm, p 1, yb, sl 1, yf, p 1, yb, sl 1. Turn. Row 3: (LS, LC): bring LC under DC, p 1, yb, sl 1, yf, p 1, yb, sl 1, sm, *yfsl1yo, (brk 1, yfsl1yo) 9 times, sm, p 6, p3tog, p 6, sm, repeat from * 1 more time, yfsl1yo, (brk 1, yfsl1yo) 9 times, sm, yb, sl1, yf, p 1, yb, sl 1, yf, p 1. Do not turn, slide work to the other end of the needle. Row 3 (LS, DC): sl sl 1, yb, k 1, yf, sl1, yb, k 1, sm, * (brp 1, sl1yof) 9 times, brp 1, sm, k 1, m 1, k 11, m 1, k 1, sm, repeat from * 1 more time, (brp 1, sl1yof) 9 times, brp 1, sm, k 1, yf, sl1, yb, k 1, yf, sl1. Turn. Row 4 (DS, LC): bring LC under DC on LS, k 1, yf, sl 1, yb, k 1, yf, sl 1, sm, *(sl1yof, brp 1) 9 times, sl1yof, sm, k 15, sm, repeat from * 1 more time, (sl1yof, brp 1) 9 times, sl1yof, sm, yf, sl 1, yb, k 1, yf, sl 1, yb, k 1. Do not turn, slide work to the other end of the needle. Row 4 (DS, DC): sl 1, p 1, yb, sl 1, yf, p 1, sm, *(brk1, yfsl1yo) 9 times, brk 1, sm, p 15, sm, repeat from * 1 more time, *(brk1, yfsl1yo) 9 times, brk 1, sm, p 1, yb, sl 1, yf, p 1, yb, sl 1. Turn. Rows 5-12 (LC and DC): repeat rows 1-4. Row 13 (LS, LC): bring LC under DC, p 1, yb, sl 1, yf, p 1, yb, sl 1, sm, *yfsl1yo, (brk 1, yfsl1yo) 3 times, br4stdec, (yfsl1yo, brk) 3 times, yfsl1yo, sm, p 6, p3tog, p 6, sm, repeat from * 1 more time, yfsl1yo, (brk 1, yfsl1yo) 3 times, br4stdec, (yfsl1yo, brk) 3 times, yfsl1yo, sm, yb, sl1, yf, p 1, yb, sl 1, yf, p 1. Do not turn, slide work to the other end of the needle. Row 13 (LS, DC): sl 1, yb, k 1, yf, sl1, yb, k 1, sm, (brp 1, sl1yof) 7 times, brp 1, sm, k 13, sm, repeat from * 1 more time, (brp 1, sl1yof) 7 times, brp 1, sm, k 1, yf, sl1, yb, k 1, yf, sl1. Turn. Row 14 (DS, LC): bring LC under DC on LS, k 1, yf, sl 1, yb, k 1, yf, sl 1, sm, *(sl1yof, brp 1) 7 times, sl1yof, sm, k 13, sm, repeat from * 1 more time, (sl1yof, brp 1) 7 times, sl1yof, sm, yf, sl 1, yb, k 1, yf, sl 1, yb, k 1. Do not turn, slide work to the other end of the needle. Row 14 (DS, DC): sl 1, p 1, yb, sl 1, yf, p 1, sm, *(brk1, yfsl1yo) 7 times, brk 1, sm, p 13, sm, repeat from * 1 more time, *(brk1, yfsl1yo) 7 times, brk 1, sm, p 1, yb, sl 1, yf, p 1, yb, sl 1. Turn. Row 15 (LS, LC): bring LC under DC, p 1, yb, sl 1, yf, p 1, yb, sl 1, sm, *yfsl1yo, (brk 1, yfsl1yo) 7 times, yfsl1yo, sm, p 5, p3tog, p 5, sm, repeat from * 1 more time, yfsl1yo, (brk 1, yfsl1yo) 7 times, yfsl1yo, sm, yb, sl1, yf, p 1, yb, sl 1, yf, p 1. Do not turn, slide work to the other end of the needle. Row 15 (LS, DC): sl 1, yb, k 1, yf, sl1, yb, k 1, sm, (brp 1, sl1yof) 7 times, brp 1, sm, k 11, sm, repeat from * 1 more time, (brp 1, sl1yof) 7 times, brp 1, sm, k 1, yf, sl1, yb, k 1, yf, sl1. Turn. Row 16 (DS, LC): bring LC under DC on LS, k 1, yf, sl 1, yb, k 1, yf, sl 1, sm, *(sl1yof, brp 1) 7 times, sl1yof, sm, k 11, sm, repeat from * 1 more time, (sl1yof, brp 1) 7 times, sl1yof, sm, yf, sl 1, yb, k 1, yf, sl 1, yb, k 1. Do not turn, slide work to the other end of the needle. Row 16 (DS, DC): sl 1, p 1, yb, sl 1, yf, p 1, sm, *(brk1, yfsl1yo) 7 times, brk 1, sm, p 11, sm, repeat from * 1 more time, *(brk1, yfsl1yo) 7 times, brk 1, sm, p 1, yb, sl 1, yf, p 1, yb, sl 1. Turn. Row 17 (LS, LC): bring LC under DC, p 1, yb, sl 1, yf, p 1, yb, sl 1, sm, *yfsl1yo, (brk 1, yfsl1yo) 7 times, yfsl1yo, sm, p 11, sm, repeat from * 1 more time, yfsl1yo, (brk 1, yfsl1yo) 7 times, yfsl1yo, sm, yb, sl1, yf, p 1, yb, sl 1, yf, p 1. Do not turn, slide work to the other end of the needle. Row 17 (LS, DC): sl 1, yb, k 1, yf, sl1, yb, k 1, sm, (brp 1, sl1yof) 7 times, brp 1, sm, k 11, sm, repeat from * 1 more time, (brp 1, sl1yof) 7 times, brp 1, sm, k 1, yf, sl1, yb, k 1, yf, sl1. Turn. Row 18 (DS, LC): bring LC under DC on LS, k 1, yf, sl 1, yb, k 1, yf, sl 1, sm, *(sl1yof, brp 1) 7 times, sl1yof, sm, k 11, sm, repeat from * 1 more time, (sl1yof, brp 1) 7 times, sl1yof, sm, yf, sl 1, yb, k 1, yf, sl 1, yb, k 1. Do not turn, slide work to the other end of the needle. Row 18 (DS, DC): sl 1, p 1, yb, sl 1, yf, p 1, sm, *(brk1, yfsl1yo) 7 times, brk 1, sm, p 11, sm, repeat from * 1 more time, *(brk1, yfsl1yo) 7 times, brk 1, sm, p 1, yb, sl 1, yf, p 1, yb, sl 1. Turn. Rows 19-50: repeat rows 17-18. Rows 51-58: work Double Knitting Stripe (see instructions above) on the first and last brioche stripes, the rest continue as established. Rows 59-70: repeat rows 17-18. Rows 71-78: work Double Knitting Stripe (see instructions above) on the middle brioche stripe, the rest continue as established. Rows 79-100: repeat rows 17-18. Row 1 (LS, LC): bring LC under DC, p 1, yb, sl 1, yf, p 1, yb, sl 1, sm, *yfsl1yo, brsssk, yfsl1yo, brk 1, yfsl1yo, brk4stinc, yfsl1yo, brk 1, yfsl1yo, brk2tog, yfsl1yo, sm, p 11, sm, repeat from * 1 more time, yfsl1yo, brsssk, yfsl1yo, brk 1, yfsl1yo, brk4stinc, yfsl1yo, brk 1, yfsl1yo, brk2tog, yfsl1yo, sm, yb, sl1, yf, p 1, yb, sl 1, yf, p 1. Do not turn, slide work to the other end of the needle. Row 1 (LS, DC): sl 1, yb, k 1, yf, sl1, yb, k 1, sm, (brp 1, sl1yof) 2 times, brp 1, (sl1yof, p 1) 2 times, sl1yof, (brp 1, sl1yof) 2 times, brp 1, sm, k 5, m 1, k 1, m1, k 5, sm, repeat from * 1 more time, (brp 1, sl1yof) 2 times, brp 1, (sl1yof, p 1) 2 times, sl1yof, (brp 1, sl1yof) 2 times, brp 1, sm, k 1, yf, sl1, yb, k 1, yf, sl1. Turn. Row 2 (DS, LC): bring LC under DC on LS, k 1, yf, sl 1, yb, k 1, yf, sl 1, sm, *(sl1yof, brp 1) 7 times, sl1yof, sm, k 13, sm, repeat from * 1 more time, (sl1yof, brp 1) 7 times, sl1yof, sm, yf, sl 1, yb, k 1, yf, sl 1, yb, k 1. Do not turn, slide work to the other end of the needle. Row 2 (DS, DC): sl 1, p 1, yb, sl 1, yf, p 1, sm, *(brk1, yfsl1yo) 7 times, brk 1, sm, p 13, sm, repeat from * 1 more time, *(brk1, yfsl1yo) 7 times, brk 1, sm, p 1, yb, sl 1, yf, p 1, yb, sl 1. Turn. Row 3 (LS, LC): bring LC under DC, p 1, yb, sl 1, yf, p 1, yb, sl 1, sm, *yfsl1yo, (brk 1, yfsl1yo) 7 times, yfsl1yo, sm, p 13, sm, repeat from * 1 more time, yfsl1yo, (brk 1, yfsl1yo) 7 times, yfsl1yo, sm, yb, sl1, yf, p 1, yb, sl 1, yf, p 1. Do not turn, slide work to the other end of the needle. Row 3 (LS, DC): sl 1, yb, k 1, yf, sl1, yb, k 1, sm, (brp 1, sl1yof) 7 times, brp 1, sm, k 13, sm, repeat from * 1 more time, (brp 1, sl1yof) 7 times, brp 1, sm, k 1, yf, sl1, yb, k 1, yf, sl1. Turn. Row 4 (DS, LC): bring LC under DC on LS, k 1, yf, sl 1, yb, k 1, yf, sl 1, sm, *(sl1yof, brp 1) 7 times, sl1yof, sm, k 13, sm, repeat from * 1 more time, (sl1yof, brp 1) 7 times, sl1yof, sm, yf, sl 1, yb, k 1, yf, sl 1, yb, k 1. Do not turn, slide work to the other end of the needle. Row 4 (DS, DC): sl 1, p 1, yb, sl 1, yf, p 1, sm, *(brk1, yfsl1yo) 7 times, brk 1, sm, p 13, sm, repeat from * 1 more time, *(brk1, yfsl1yo) 7 times, brk 1, sm, p 1, yb, sl 1, yf, p 1, yb, sl 1. Turn. Row 5 (LS, LC): bring LC under DC, p 1, yb, sl 1, yf, p 1, yb, sl 1, sm, *yfsl1yo, brsssk, yfsl1yo, brk 1, yfsl1yo, brk4stinc, yfsl1yo, brk 1, yfsl1yo, brk2tog, yfsl1yo, sm, p 13, sm, repeat from * 1 more time, yfsl1yo, brsssk, yfsl1yo, brk 1, yfsl1yo, brk4stinc, yfsl1yo, brk 1, yfsl1yo, brk2tog, yfsl1yo, sm, yb, sl1, yf, p 1, yb, sl 1, yf, p 1. Do not turn, slide work to the other end of the needle. Row 5 (LS, DC): sl 1, yb, k 1, yf, sl1, yb, k 1, sm, (brp 1, sl1yof) 2 times, brp 1, (sl1yof, p 1) 2 times, sl1yof, (brp 1, sl1yof) 2 times, brp 1, sm, k 6, m 1, k 1, m1, k 6, sm, repeat from * 1 more time, (brp 1, sl1yof) 2 times, brp 1, (sl1yof, p 1) 2 times, sl1yof, (brp 1, sl1yof) 2 times, brp 1, sm, k 1, yf, sl1, yb, k 1, yf, sl1. Turn. Row 6 (DS, LC): bring LC under DC on LS, k 1, yf, sl 1, yb, k 1, yf, sl 1, sm, *(sl1yof, brp 1) 7 times, sl1yof, sm, k 15, sm, repeat from * 1 more time, (sl1yof, brp 1) 7 times, sl1yof, sm, yf, sl 1, yb, k 1, yf, sl 1, yb, k 1. Do not turn, slide work to the other end of the needle. Row 6 (DS, DC): sl 1, p 1, yb, sl 1, yf, p 1, sm, *(brk1, yfsl1yo) 7 times, brk 1, sm, p 15, sm, repeat from * 1 more time, *(brk1, yfsl1yo) 7 times, brk 1, sm, p 1, yb, sl 1, yf, p 1, yb, sl 1. Turn. Row 7 (LS, LC): bring LC under DC, p 1, yb, sl 1, yf, p 1, yb, sl 1, sm, *yfsl1yo, (brk 1, yfsl1yo) 7 times, yfsl1yo, sm, p 15, sm, repeat from * 1 more time, yfsl1yo, (brk 1, yfsl1yo) 7 times, yfsl1yo, sm, yb, sl1, yf, p 1, yb, sl 1, yf, p 1. Do not turn, slide work to the other end of the needle. Row 7 (LS, DC): sl 1, yb, k 1, yf, sl1, yb, k 1, sm, (brp 1, sl1yof) 7 times, brp 1, sm, k 15, sm, repeat from * 1 more time, (brp 1, sl1yof) 7 times, brp 1, sm, k 1, yf, sl1, yb, k 1, yf, sl1. Turn. Row 8 (DS, LC): bring LC under DC on LS, k 1, yf, sl 1, yb, k 1, yf, sl 1, sm, *(sl1yof, brp 1) 7 times, sl1yof, sm, k 15, sm, repeat from * 1 more time, (sl1yof, brp 1) 7 times, sl1yof, sm, yf, sl 1, yb, k 1, yf, sl 1, yb, k 1. Do not turn, slide work to the other end of the needle. Row 8 (DS, DC): sl 1, p 1, yb, sl 1, yf, p 1, sm, *(brk1, yfsl1yo) 7 times, brk 1, sm, p 15, sm, repeat from * 1 more time, *(brk1, yfsl1yo) 7 times, brk 1, sm, p 1, yb, sl 1, yf, p 1, yb, sl 1. Turn. Row 9 (LS, LC): bring LC under DC, p 1, yb, sl 1, yf, p 1, yb, sl 1, sm, *yfsl1yo, brsssk, yfsl1yo, brk 1, yfsl1yo, brk4stinc, yfsl1yo, brk 1, yfsl1yo, brk2tog, yfsl1yo, sm, p 15, sm, repeat from * 1 more time, yfsl1yo, brsssk, yfsl1yo, brk 1, yfsl1yo, brk4stinc, yfsl1yo, brk 1, yfsl1yo, brk2tog, yfsl1yo, sm, yb, sl1, yf, p 1, yb, sl 1, yf, p 1. Do not turn, slide work to the other end of the needle. Row 9 (LS, DC): sl 1, yb, k 1, yf, sl1, yb, k 1, sm, (brp 1, sl1yof) 2 times, brp 1, (sl1yof, p 1) 2 times, sl1yof, (brp 1, sl1yof) 2 times, brp 1, sm, k 1, ssk, k 4, m 1, k 1, m 1, k 4, k2tog, k 1, sm, repeat from * 1 more time, (brp 1, sl1yof) 2 times, brp 1, (sl1yof, p 1) 2 times, sl1yof, (brp 1, sl1yof) 2 times, brp 1, sm, k 1, yf, sl1, yb, k 1, yf, sl1. Turn. Row 10 (DS, LC): bring LC under DC on LS, k 1, yf, sl 1, yb, k 1, yf, sl 1, sm, *(sl1yof, brp 1) 7 times, sl1yof, sm, k 15, sm, repeat from * 1 more time, (sl1yof, brp 1) 7 times, sl1yof, sm, yf, sl 1, yb, k 1, yf, sl 1, yb, k 1. Do not turn, slide work to the other end of the needle. Row 10 (DS, DC): sl 1, p 1, yb, sl 1, yf, p 1, sm, *(brk1, yfsl1yo) 7 times, brk 1, sm, p 15, sm, repeat from * 1 more time, *(brk1, yfsl1yo) 7 times, brk 1, sm, p 1, yb, sl 1, yf, p 1, yb, sl 1. Turn. Row 11 (LS, LC): bring LC under DC, p 1, yb, sl 1, yf, p 1, yb, sl 1, sm, *yfsl1yo, (brk 1, yfsl1yo) 7 times, yfsl1yo, sm, p 15, sm, repeat from * 1 more time, yfsl1yo, (brk 1, yfsl1yo) 7 times, yfsl1yo, sm, yb, sl1, yf, p 1, yb, sl 1, yf, p 1. Do not turn, slide work to the other end of the needle. Row 11 (LS, DC): sl 1, yb, k 1, yf, sl1, yb, k 1, sm, (brp 1, sl1yof) 7 times, brp 1, sm, k 15, sm, repeat from * 1 more time, (brp 1, sl1yof) 7 times, brp 1, sm, k 1, yf, sl1, yb, k 1, yf, sl1. Turn. Row 12 (DS, LC): bring LC under DC on LS, k 1, yf, sl 1, yb, k 1, yf, sl 1, sm, *(sl1yof, brp 1) 7 times, sl1yof, sm, k 15, sm, repeat from * 1 more time, (sl1yof, brp 1) 7 times, sl1yof, sm, yf, sl 1, yb, k 1, yf, sl 1, yb, k 1. Do not turn, slide work to the other end of the needle. Row 12 (DS, DC): sl 1, p 1, yb, sl 1, yf, p 1, sm, *(brk1, yfsl1yo) 7 times, brk 1, sm, p 15, sm, repeat from * 1 more time, *(brk1, yfsl1yo) 7 times, brk 1, sm, p 1, yb, sl 1, yf, p 1, yb, sl 1. Turn. Row 13 (LS, LC): bring LC under DC, p 1, yb, sl 1, yf, p 1, yb, sl 1, sm, *yfsl1yo, (brk 1, yfsl1yo) 3 times, brk4stinc, yfsl1yo, (brk 1, yfsl1yo) 3 times, yfsl1yo, sm, p 15, sm, repeat from * 1 more time, yfsl1yo, (brk 1, yfsl1yo) 3 times, brk4stinc, yfsl1yo, (brk 1, yfsl1yo) 3 times, yfsl1yo, sm, yb, sl1, yf, p 1, yb, sl 1, yf, p 1. Do not turn, slide work to the other end of the needle. Row 13 (LS, DC): sl 1, yb, k 1, yf, sl1, yb, k 1, sm, (brp 1, sl1yof) 3 times, brp 1, (sl1yof, p 1) 2 times, sl1yof, (brp 1, sl1yof) 3 times, brp 1, sm, k 1, ssk, k 4, m 1, k 1, m 1, k 4, k2tog, k 1, sm, repeat from * 1 more time, (brp 1, sl1yof) 3 times, brp 1, (sl1yof, p 1) 2 times, sl1yof, (brp 1, sl1yof) 3 times, brp 1, sm, k 1, yf, sl1, yb, k 1, yf, sl1. Turn. Row 14 (DS, LC): bring LC under DC on LS, k 1, yf, sl 1, yb, k 1, yf, sl 1, sm, *(sl1yof, brp 1) 9 times, sl1yof, sm, k 15, sm, repeat from * 1 more time, (sl1yof, brp 1) 9 times, sl1yof, sm, yf, sl 1, yb, k 1, yf, sl 1, yb, k 1. Do not turn, slide work to the other end of the needle. Row 14 (DS, DC): sl 1, p 1, yb, sl 1, yf, p 1, sm, *(brk1, yfsl1yo) 9 times, brk 1, sm, p 15, sm, repeat from * 1 more time, *(brk1, yfsl1yo) 9 times, brk 1, sm, p 1, yb, sl 1, yf, p 1, yb, sl 1. Turn. Row 15 (LS, LC): bring LC under DC, p 1, yb, sl 1, yf, p 1, yb, sl 1, sm, *yfsl1yo, (brk 1, yfsl1yo) 9 times, yfsl1yo, sm, p 15, sm, repeat from * 1 more time, yfsl1yo, (brk 1, yfsl1yo) 9 times, yfsl1yo, sm, yb, sl1, yf, p 1, yb, sl 1, yf, p 1. Do not turn, slide work to the other end of the needle. Row 15 (LS, DC): sl 1, yb, k 1, yf, sl1, yb, k 1, sm, (brp 1, sl1yof) 9 times, brp 1, sm, k 15, sm, repeat from * 1 more time, (brp 1, sl1yof) 9 times, brp 1, sm, k 1, yf, sl1, yb, k 1, yf, sl1. Turn. Row 16 (DS, LC): bring LC under DC on LS, k 1, yf, sl 1, yb, k 1, yf, sl 1, sm, *(sl1yof, brp 1) 9 times, sl1yof, sm, k 15, sm, repeat from * 1 more time, (sl1yof, brp 1) 9 times, sl1yof, sm, yf, sl 1, yb, k 1, yf, sl 1, yb, k 1. Do not turn, slide work to the other end of the needle. Row 16 (DS, DC): sl 1, p 1, yb, sl 1, yf, p 1, sm, *(brk1, yfsl1yo) 9 times, brk 1, sm, p 15, sm, repeat from * 1 more time, *(brk1, yfsl1yo) 9 times, brk 1, sm, p 1, yb, sl 1, yf, p 1, yb, sl 1. Turn. I absolutely LOVE your arteson! I visit alot of designe pages, and you are in my top 5! This would make a great jacket...which I will attempt, but I would rather have your expertise to fall on....thanks so much for your beautiful work.